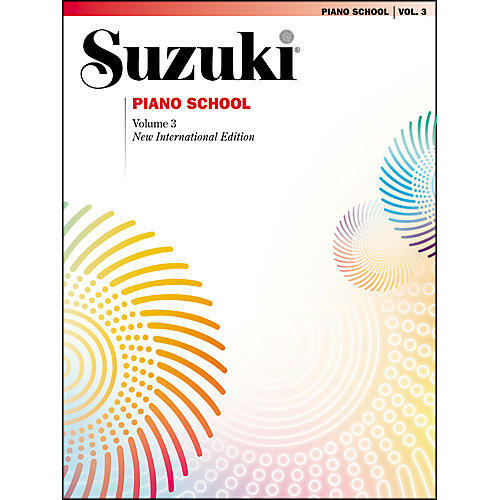 The New International Edition of Suzuki Piano School, Volume 3 includes French, German and Spanish translations, new Romantic and 20th-century pieces, as well as a newly recorded CD performed by internationally renowned recording artist Seizo Azuma. Now the book and CD can be purchased together or separately. The contents have changed slightly to include a new Romantic piece by Gurlitt and a 20th-century piece by Bartƒ³k as well as the Bach "Minuet in G Minor" (from Notebook for Anna Magdalena Bach), formerly in Volume 2. Other improvements include a cleaner appearance with less editing and spacious new engravings, as well as more detailed titles that include the keys, sources, composer dates, and catalog numbers. Titles: ¢¢ Sonatina in C Major, Op. 36, No. 1 (Allegro, Andante, Vivace) (M. Clementi) ¢¢ Minuet in G Minor, from J. S. Bach's Notebook for Anna Magdalena Bach (C. Petzold) ¢¢ Sonatina in C Major, Op. 55, No. 1 (Allegro, Vivace) (F. Kuhlau) ¢¢ Theme, from Symphony No. 3 ("Eroica"), Op. 55, 4th Movement (L. van Beethoven, Arr. Unknown) ¢¢ The Wild Rider, from Album for the Young, Op. 68, No. 8 (R. Schumann) ¢¢ Little Waltz, from Little Flowers, Op. 205, No. 10 (C. Gurlitt) ¢¢ ¢¦cossaise, K. WoO 23 (L. van Beethoven) ¢¢ Sonatina in C Major, Op. 36, No. 3 (Spiritoso) (M. Clementi) ¢¢ Teasing Song, from For Children, Sz. 42 (Bƒla Bartƒ³k).